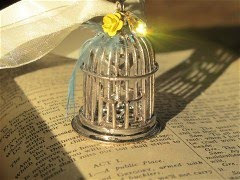 Theresa Joy : DIY Vintage Wedding ... Love it or Lump it?? Elizabeth, along with the help of her mom, created these customized wedding shoes. They bought simple black wedges and covered them in the same fabric as the dress along with some decorations. Wow, what a beautiful wedding! They sure had fun - their outfits are Awesome! My October wedding will be outdoors for the ceremony then inside for the reception. These pictures are amazing, thanks so much for sharing! I am not one for weddings but this looks like it was an awesome wedding, from the cutest couple down to the shoes!!! Modern and Vintage all rolled into one. Thanks for sharing!! !